The Govs carded a 322 to defeat the Bisons by five strokes, with freshman Taylor Dedmen and senior Taylor Goodley carding matching 79s to lead the way. Goodley led all scorers with three birdies, including the only birdie on the par-4 No. 10, while Dedmen posted a team-high 11 pars over 18 holes. Senior Reagan Greene was a shot behind Dedmen and Goodley with an 80, and was the only competitor to post an even-par average on par-5 holes. 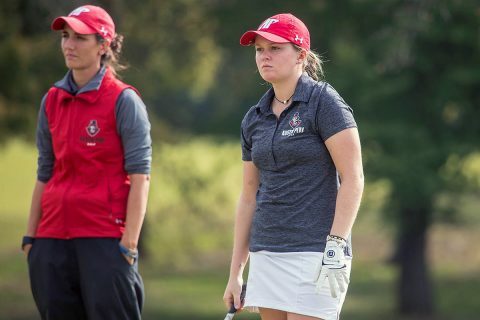 Tied for sixth were Meghann Stamps and Riley Cooper, the latter playing as an individual; both shot 84, with Cooper carding a pair of birdies. Freshman Shelby Darnell (85) and sophomore Andrea Presilla (91) rounded out the day for the Governors; Darnell was one of six players to shoot par or better on the par-5 No. 11. The Govs return to action Monday, March 11th when they travel to Dade City, Florida for the Western Kentucky-hosted Spring Break Shootout.